Crazy Mountain Lodge blends an air of luxury with the warmth of a modern, rustic retreat. Situated on 21± acres, this intimate mountain lodge is the ideal location from which to experience the riches of southwest Montana. Located near Clyde Park, Crazy Mountain Lodge offers easy access to some of Montana’s finest fly fishing, hunting, hiking, horse-back riding, skiing, mountain biking and snowshoeing. The Shields Valley still portrays a small town essence and the quietness of country life, though only a stone’s throw from mainstream Montana. Add the second home that sleeps an additional 16 people! This scenic compound is comprised of approximately 21± acres, with stunning views of the Crazy’s, Bridger’s and Absaroka Mountains. The vibrant university town of Bozeman, which consists of a population of 30,000 residents, plus approximately 15,000 students at Montana State University, is located roughly 45 minutes from the property. In recent years, Bozeman, which also is proud of its' Museum of the Rockies, has received national accolades for its scenic location, limitless outdoor activities and historic downtown. The cafes, restaurants and boutiques have become favorite places for those who love nature--whether fishing, hunting, skiing, mountain biking or hiking. A few miles west of Bozeman is Gallatin Field Airport which serves Allegiant, Frontier, Delta, Horizon Air, American and United Airlines. Bridger Bowl Ski Area as well as Bohart Nordic Ski Ranch are a short 15± minute drive west from the Crazy Mountain Lodge and offer tremendous winter activities. Additional skiing options are an approximately 2-hour drive south. The Main House is a beautifully furnished, custom 4,500± sq. ft. home with 4-bedrooms. You can also add the Guest House to include an additional 4-bedrooms, which were completed in 2016. The diverse structure could be used in a variety of ways as a corporate retreat, family compound, wedding venue or as a single family long-term rental. Equipped with a full commercial kitchen, large outdoor patio with a hot tub, and floor-to-ceiling windows to take advantage of the 3 mountain range views; it is the ultimate Montana getaway! Fly Fishing: Crazy Mountain Lodge is located minutes from the Shields River which is home to cutthroat, brown and rainbow trout. The combination of light fishing pressure, excellent habitat and incredible scenery offers the angler an experience that can only be described as “extraordinary.” In addition to fishing in the Shields River, the surrounding area offers fishing on several Blue Ribbon fisheries such as the famous Yellowstone, Smith, and Boulder Rivers. Hunting: The nearby public lands offer hunting opportunities for elk, mule deer, whitetail deer and mountain goat, to name a few. Other Recreational Activities: There are miles of hiking and biking within minutes of the lodge in nearby Forest Service land as well as downhill skiing at the legendary Bridger Bowl, located just 15 minutes from the property. Bohart Ranch Cross Country Ski Center is also an approximate 15 minute drive. A must-stay Crazy Mountain Lodge is obvious for anyone yearning for their own special retreat in Montana. The Shields Valley and the community of Clyde Park are called home by friendly people and hold the secrets to obtaining Montana’s high quality of life. 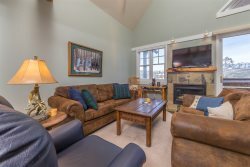 With all the area has to offer, Crazy Mountain Lodge is a synergy of recreation, beauty, and convenience. Very well maintained property with beautiful views and a great drive across Brackett Creek Rd to the Bridger Ski Area. We had a great stay, the property was easy to find as the directions were spot on. We would definitely stay at this property again and hope to plan another trip for 2019! Wonderful Lodge near Bozeman. I was part of a family of 4 with 10 children ages 10-21. We rented this lodge ( both buildings) over Christmas 2016. It was perfect! The lodge is big enough that we had plenty of room to spread out and yet cozy and comfortable. The kitchen was huge with two large refrigerators.It was easy to prepare meals for a party this large and with two large sinks and dishwashers clean up was a breeze too. The sleeping quarters are bunks and very comfortable. The bathrooms and showers are clean and modern! The views from the large windows are beautiful and while we didn't have any issues during our stay, the owners were responsive and easy to work with leading up to the rental. There is no wifi which, with kids, is not really a bad thing but signal strength was fine for keeping in touch, checking email, weather, etc. We had a great time! We rented snow machines for a couple of days. There are trails nearby for snow shoeing and cross country skiing. Bridger Bowl ski lodge is about a 30 dive away and a bunch of us went skiing one day. The lodge was a great fit for our group. Instead of splitting up for the night and driving to separate homes we were able to be under one roof. It really helped maximize our time. We really enjoyed our stay and we are looking forward to doing it again next year. The views of crazy mountains were spectacular! The hunting lodge is nestled in the prairie with lots of privacy. Very quiet and relaxing. A short 15-20 mins ride to Bridger Bowl. This was perfect for our family needs. (3 families) We would stay there again! Thanks!